After surgery the process of rehabilitation is essential in order to progress. It is difficult for any individual to regain mobility after inactivity of nerves and muscles. After the lesion a long time and rigorous rehabilitation is required. This means if the central nervous system, or the spinal cord, which is farthest from any nerve ending is damaged, the progress requires even more effort. Moreover, this rehabilitation needs to be followed medically because the body of a medullar injured is weakened. 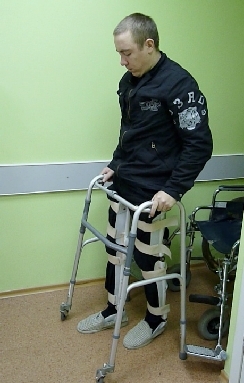 The lack of effective rehabilitation in Ukraine is due to lack of finances in the country. Ukraine became the second poorest country in Europe after Moldova. All these make the physical and moral situation of a paraplegic very difficult. Not to mention that of a quadriplegic! These gaps in rehabilitation impede the evolution of the person who should take charge of himself alone. Progress is slow, barely visible, and as soon as the patient regains conscienceless, the motivation diminishes until it risks disappearing completely.